Ardis Bazyn and her husband Kevin Berkery took part in the American Council of the Blind 5K Walk-a-thon on July 10, 2010. 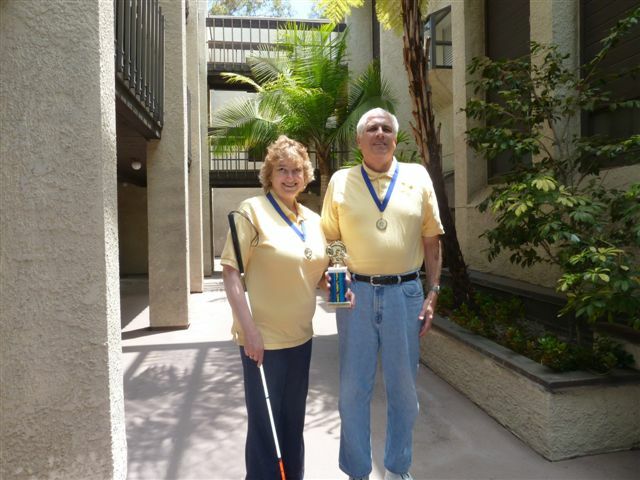 Kevin and Ardis won a trophy for the amount of sponsors they solicited for the cause and each received a bronze medal. "Blind to walk at Arizona Mills Mall"
Along the mile trail inside the Arizona Mills mall, the blind and visually impaired will be taking a stand. At the second annual American Council of the Blind Walk-a-Thon on Saturday, the blind will walk alongside volunteers, pledging money for the council. "We want to get out there and show people what blind people can do," said Dan Dillon, chairman of the walk committee. "We want people to see that most blind people don't just sit at home and listen to the radio." Participants can walk the mall once or up to three times. Brenda Dillon, Dan's wife and the council's second vice president, said fundraising is crucial. "We don't have the resources to fund every program we want to offer," she said. "The Walk-a-Thon is an opportunity to demonstrate the normal, everyday lifestyle of people who are blind and visually impaired. We're just people who happen to not have normal vision. We have the same goals and concerns of our colleagues as everyone else." Anyone can pledge money and walk, but most participants will be members of the council flying out for a national convention in Phoenix, which begins Friday. Dillon, who is an advocate of physical fitness and a frequent player of blind golf, said members enjoy exploring new places during the conventions. (And about the golf, they play with sighted volunteers.) Conventioneers will tour the Grand Canyon and attend an Arizona Diamondbacks game. "When we roll into town, blind people, like anyone else, spend a lot of money at restaurants and gift shops," he said. "We've found that it's an educational experience for people who work in the hotels or restaurants and are meeting blind people for the first time." Many members of the council are quite active, Dillon said. One member is a contender for the Iron Man competition. As an organization, the council seeks to ensure the blind and visually impaired are provided equal treatment by the government. "We want to promote employment and social opportunities for the blind," he said. They recently won a case against the Treasury Department and now paper currency in the United States will eventually be accessible to the blind. The council works to broaden employment opportunities for the blind and visually impaired. Right now, one of the most popular jobs for the blind is medical transcribing, made newly available because of speech software. "We have computers with new speech software that has opened up a lot of employment opportunities for the blind and visually impaired," he said. The Walk-a-Thon is anticipating about 75 participants. About a dozen of those participants are virtual walkers -- people who can't make it to the convention and are walking around their neighborhood. Last year's event, held in Orlando, raised about $24,000.